The 900km long Mawson Trail has been set up as some sort of tourist adventure by the South Australian government and the level of investment in signage and the trail documentation is impressive. The route seems designed by watching the track an ant would take across a map: ie, it’s all over the place. If there’s a direct road between places the trail will usually take some other more deviant route up an adjacent valley then with a hill up-and-over involved. The Mawson is a mountain bike trail, rather than a cycle tour, over pre-existing unsealed back roads, forestry tracks, fire trails, farm roads etc that has had plenty of signage installed along the way. It’s a fantastic introduction to off-highway dirt track riding, more challenging than you might think, particularly the steep sections on the first few days when you head through the Adelaide Hills and into the Barossa Valley. The whole track is scenic but the north section through the Flinders Ranges is particularly dramatic. For the official, essential, Mawson Trail maps at 1:750,000 scale contact: Bicycle SA, 111 Franklin Street, Adelaide SA 5000. Ph 8168 9999. 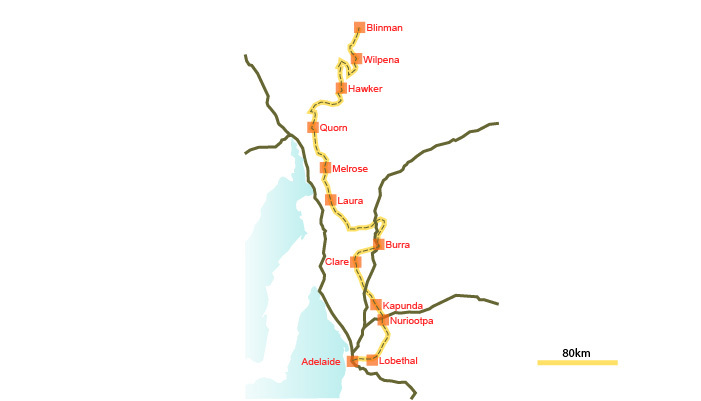 Email: office @ bikesa.asn.au The 9 individual Mawson Trail maps in 3 separate map packs are well annotated with history and sights along the way and each covering 100km of the track. They show how to get into and out of the towns and that’s surprisingly useful. Also shows the typography for each day. The Hema Flinders Ranges map is useful for an overview and once you head off to Arkaroola. Allow 14 days riding with one day off in Clare to sample the fabbo wines of the area and another at Wilpena to climb St Marys Peak. But don’t rush it, take your time. March to November inclusive. It’s way too hot in the middle of summer. You get to the start using the Adelaide bike paths and then have a (very) few deceptively flat kilometres of seal up the gorge. You then start to make the ascent up some steep farm roads and fire trails and the sweat starts to pour out. There’s a series of locked gates that you avoid by having a steel channel for the bike wheels to slot in as you push your bike (and maybe trailer) up and over a motorbike proof obstruction. At this point you may well start to question exactly what you are getting into. It’s hard to generalise about the road condition except to say a mountain bike with fat tyres would be useful. There’s every type of road surface except deep sand. The commercial supported tours use full suspension bikes. The signage is excellent with one sign before any turn and another immediately after as well as the occasional sign to reassure you are taking the correct road. Usually the track is obvious but in the Bundaleer Forest there’s a point where the signage is indicative only because you are directed along a sheep track that finishes at the top of a hill and then you follow along a fenceline for a kilometre with no track at all. It’s rare for signage to be missing. You may get sick of opening and closing gates on those first days from Adelaide. You only really need to consider water as an issue once you are heading out of Quorn. Even then it’s usually only one night out and two days. Before that you are only usually carrying water for the day. Coles and Woolworths supermarkets with nation wide pricing in Adelaide, IGA style supermarkets open 7 days until 7pm in Lobethal, Nuriootpa, Tanunda, Burra, Spalding and Quorn. Woolworths in Clare. 3 patchy stores at Hawker. A few expensive groceries at Wilpena. Ditto Blinman. If you are heading on from Blinman it would be worth posting some food to yourself to pick up there. Paid campsites at Nuriootpa, about $22 per site (2009); Clare, $20 per site; Burra, $13pp; Laura, $8pp; Melrose $7.50pp; Quorn, $9pp for cyclists, it’s a support the environment initiative by the owners; and Hawker, $15pp. A national park site at Wilpena is $10pp and there’s plenty to choose from. All those paid sites have hot showers, flush toilets, laundry, bbq, etc. If you don’t like paying even those sort of prices there’s plenty of spots to camp for free. A free, if dusty, bed is at Mount Bryan East, in the old school house and the next night at Hallett in the disused railway station. These accommodations have combination locks on the door but a clue to successful entry is that they are the local postcode. 32km past Wilpena you can stay at the unlocked Middlesight Waters Hut out in the middle of not much. Travelling through the some of Australia’s most well known wine Barossa and Clare Valleys. You go close by Jacobs Creek, Peter Lehmann and Penfolds in the Barossa. The Mawson incorporates the 22km Riesling Trail that runs along an old railway line in the Clare Valley and it’s worth using it to check out Mt Horrocks, Pikes (a bit off the track), and Tim Adams. The beer at Knappstein is delicious. Some historic buildings to see at Burra. There’s the mountain bike tracks in Melrose and you can use it as a base to climb the 995m high Mt Remarkable. Some aboriginal paintings at Yourambulla Caves before Hawker. Exploring the hills around Wilpena Pound. There’s plenty to distract you from your journey. National Parks and Forest Reserves are closed when a Total Fire Ban is declared and the public must not enter on these days. Contact the Fire Ban Hotline on 1300 362 361. Never attempt more than 3 wineries on the same day. Having sufficient food after Quorn where there is the last decent grocery store on the trail requires a bit of planning. If you are continuing on to Arkaroola then Blinman has very limited supplies at the solitary store. There’s three particularly tough sections of the track. The first is just out of Adelaide when you are climbing out of The Gorge. 26km from the Festival Centre and you are starting to say WTF as you push up a sharp fire trail. The second is also mercifully short, getting over the saddle just before you drop down into Quorn. Very soft track with plenty of fist sized rocks. The last, and longer, grunt to be aware of is the section just north of Hawker until you get to the Moralana Scenic Drive turnoff. The track is fully horizontal but very soft and slow. These 30 images give a general impression of the road conditions you are likely to encounter on the trail. I had a “discussion” with the publican who runs all Blinman’s accommodation about how advertising “backpacker’s bunkhouse” means you pay for only the bunk and not the whole room. Not an argument, just some customer feedback. $50 for a backpacker’s bunk for the night seemed slightly excessive. It ended with him stating he didn’t like my “types” and him walking out of his North Blinman Hotel leaving no one to serve. I didn’t get that beer at the end of the trail after all.